RAFALETOWN, Corsica --- French air force Rafale combat aircraft deployed here as part of the UN-sanctioned Libyan No-Fly Zone are for the first time making full use of the aircraft’s “omnirole” capabilities, which allow a single aircraft to carry out the full gamut of missions during a single sortie. Pilots of the eight-ship Rafale detachment based here at Solenzara air base in Corsica, and provisionally dubbed “Rafaletown,” routinely take off with four MICA air-to-air missiles, three or six AASM Hammer precision-guided bombs, a Thales Damoclès laser targeting pod or a Reco NG reconnaissance pod and two drop tanks. They can be tasked or re-tasked in flight, and routinely are, to fly combat air patrol, precision strike or reconnaissance missions during the same six- or seven-hour sortie. The AASM, or Armement Air-Sol Modulaire which carries the NATO designation SBU-38, is a precision-guided bomb developed by Sagem, and exists in two versions, with inertial/GPS or inertial/GPS/infrared imaging guidance. A laser-guided version is being developed. “Rafale was involved in Libya from Day One, and we fly several missions during a single sortie,” says detachment commander Lt. Col. Pierre G., stressing that “Omnirole Rafale” is not simply an advertising slogan but an accurate description of the aircraft’s very real capabilities. “Over Libya, the Rafale flies all kinds of missions, carrying out strike assignments and reconnaissance with the Reco NG pod while conducting our main mission, which is combat air patrol. Pierre G. and other Rafale pilots spoke to reporters during a two-day tour organized by the French defense procurement agency, DGA, and the companies involved in the Rafale program. Because of operational security, pilots are referred to by their first name, or not identified at all. The Rafales work in a truly networked environment, and are fed targeting and other tactical data from a wide range of coalition sources through the Link 16 datalink. Incoming data is combined with that collected by the aircraft’s own sensors – Thales SPECTRA self-protection suite, OSF electro-optics, RBE-2 radar and even the infra-red guided version of MBDA’s MICA air-to-air missile which, as it scans continuously, can provide IR imagery to the central data processing system. “MICA is not just a missile, it’s an extra sensor as well,” says Pierre G., and its detection range is much longer than generally supposed. Data from all on-board and off-board sensors are combined into a single tactical picture presented to the pilot on the cockpit’s central color display or, if desired, on one of the lateral displays. The pilot can select the data he wants, combine it with other data, and pass it on to his wingman or to other allied aircraft, ships or ground troops through the Link 16, without speaking a single word on the radio and, if not using the radar, without any transmission whatsoever. Link 16 can also be used to de-conflict assignments with other aircraft without using radios. To illustrate the Rafale’s networking capabilities, one pilot described how the aircraft can receive target coordinates from an AWACS or another aircraft via Link 16. To accept the assignment, the pilot pushes a button, and the coordinates are automatically programmed into the AASM guided bombs, with no further action by the pilot who, once in range (up to 30 nautical miles), again pushes a single button to launch all three – or all six – AASMs to their individual targets. “We can fire the AASM against targets abeam or behind us, and can hit up to six in a single pass,” the pilot continues. At Solenzara, reporters were shown video footage taken during a ground attack mission in Libya, in which three tanks said to be firing against civilian targets were destroyed by simultaneous direct hits by AASM. To avoid overloading the pilot, the aircraft’s central computer prioritizes targets according to the threat they represent, and there are also modes to de-clutter the radar scope. The pilot can also decide to concentrate on a given aspect of the mission, and come back to others aspects. 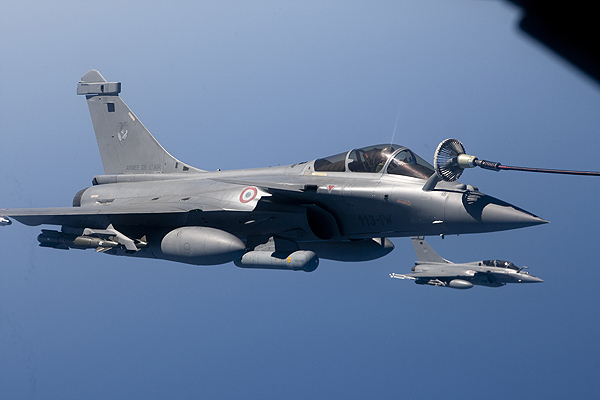 Rafale’s capabilities are changing the way the French air force operates. Previously, distinct pilot “communities” developed around each of the main missions flown – air defense, ground attack, strike, etc. – and lived more or less independently of each other. With the Rafale, however, this phenomenon is fading away since any unit, any aircraft and any pilot fly air-defense, strike or ground attack missions, as required. Specialization will disappear, several officers said, to be replaced by fewer but far more flexible aircraft and pilots. “The idea that a single aircraft can be re-tasked in flight from reconnaissance to strike to interception during the same sortie is truly revolutionary, and we’re just now beginning to understand all that this implies,” says one officer. This flexibility also translates into a major advantage for operational management, because any available Rafale can be tasked for any mission, without needing, as in the past, for a given aircraft-weapon combination to be available. Missions from Solenzara are flown in two waves each day, one in daytime and the other at night, and the Rafales fire GPS-guided AASMs or laser-guided GBU-12 bombs on almost every mission. One Rafale also fired two Scalp cruise missiles, but so far the detachment has not fired the 30mm cannon as the minimum altitude mandated by the air staff is too high to use guns to good effect. Transit to Libya is flown at 50% power setting, which translates to Mach 0.9 cruise speed even with six AASM bombs and two large underwing drop tanks. 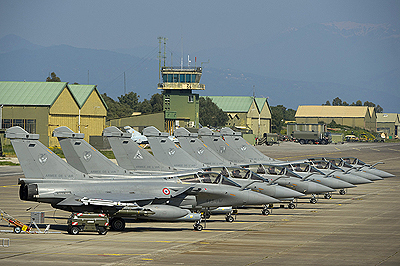 The detachment deployed at Solenzara comprises eight Rafales – a mix of single- and two-seaters – and three Mirage F-1CR dedicated reconnaissance aircraft, with 20 aircrew and supported by about 100 ground staff, 70% of them for Rafale, and 30 people to operate the intelligence detachment. Since Operation Harmattan (the French designation for enforcing the Libya No-Fly Zone) began on March 19, the detachment has flown 2,200 flight hours with over 1,500 in-flight refuellings, initially from their main operating base at Saint Dizier, in north-eastern France, and subsequently from Solenzara. Aircraft turn-around, even with live weapons on board, requires only 90 minutes and an engine change requires one hour, although none have been changed during current operations. Because of the time wasted flying from Solenzara to Libya, France is negotiating to transfer its Rafale detachment to Sigonella air base, in Sicily, which is much closer to the combat area. For the same reason, French air force Mirages have already been redeployed to Crete. Maintenance requirements of the Rafale are about 25% lower than for the Mirage 2000, and there is no scheduled or preventive maintenance; maintenance depends only on the type of mission flown, and on the condition of components. Pilots at Solenzara say that, in just over two months of operations, no missions were aborted because of aircraft unavailability, and detachment commander Lt. Col. Pierre G. says that the availability rate is close to 100%.